“When a journalist talks about PV cells, we know we are dealing with an amateur.” Jerry Stokes, President of Suntech Europe, drops this little admonition on me as he talks me over their installation at the Kingspan (Code Level 6) Lighthouse at Offsite 2007 (see previous post). As I have already used PV cells several times in the conversation so far, he has already pencilled me in as a numbskull. I reflect on the number of times I have casually written about PV cells over the years. Oh well, you live and learn. Apparently the photovoltaic cells are the tiny little bits that make up the modules, arrays or panels (all of which are OK to refer to) but on their own are not very useful. You need thousands of cells to make a module. I will know next time. Suntech is an interesting company. It was started in China in 2001 by Shi Zhengrong, a solar engineer. It’s seen explosive growth, mainly supplying the German photovoltaic boom, and is now listed on the NYSE with a valuation of around $5.5billion. How many six-year-old companies have done that in Britain? (Don’t know, but expect answer to be none). Shi, who owns 40% of the company, is now one of the richest men in mainland China. All from making photovoltaics. At the Offsite exhibition last week, Suntech were showing off a Japanese PV system called Photovol Glass which is the first translucent photovoltaic skin I have seen. It can be used as a substitute for glass in applications like glazed facades and roofs. As well as generating electricity, it cuts out heat transfer and UV radiation, but admits around 10% of daylight, thus making it suitable for large glazed facades or roof panels. 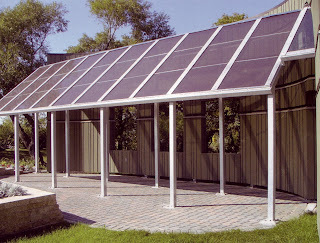 Money wasn’t mentioned in my conversation with Stokes, so I can only assume that it costs rather more than traditional PV, which is hardly well-known for being cheap in the first place, but if it rolls out as Suntech hope, it could pave the way for one day becoming a replacement for standard glass. Or maybe not. What does an amateur like me really know about this stuff? As for the facade modules being more expensive that regular modules, you are correct, though the difference should be quite small. If the modules are used in place of some other building material, though, you can subtract the cost of the building material from the module cost and often get a much lower "effective cost" for the modules.